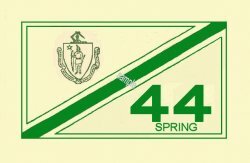 1944 Massachusetts Spring Inspection Sticker - $20.00 : Bob Hoyts Classic Inspection Stickers, Add a Final Touch to your Restoration! This 1944 Massachusetts Inspection sticker was restored and reproduced both front and back, identical to the original. We believe this to be a spring sticker based on other information we have so we added "Spring" to it to help clarify the correct season.